Our attorneys have a long and proven record of success in obtaining favorable results for our clients in real estate and construction litigation matters. Our representation in these areas includes litigation in numerous forums throughout multiple states, including federal and state courts, arbitration proceedings, and administrative hearings. Our Real Estate Litigation attorneys regularly represent clients in a wide range of legal disputes involving real property such as commercial lease disputes, land use disputes, regulatory matters, and property development. We also have successfully represented numerous types of clients in the construction industry—project owners, engineers, architects and other design professionals, developers, homeowners, general contractors, subcontractors, manufacturers, equipment suppliers, and materials suppliers. We represented the owner of a commercial building in a property tax dispute. After preserving our client's rights by filing petitions with the Oregon Tax Court and the Board of Property Tax Appeals, we assisted the client in negotiating significant reductions in tax for rooftop telecommunications leases while preserving the building's favorable historical designation. 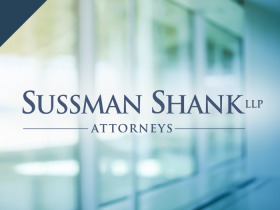 The Oregon Court of Appeals recently affirmed summary judgment in favor of Sussman Shank clients who own a controlling interest in a large Willamette Valley farm. As part of a long-running family dispute, a partial owner of the property sought the partition and sale of the farm property. We succeeded in obtaining a dismissal of the claim on the basis that the trust document did not give the trustee authority to seek partition and sale of the farm, and that his effort to do so was a breach of his fiduciary duty as trustee. We successfully represented a commercial retail client in a bitterly contested appeal of a land use application to expand the retailer's site. The successful appeal quelled the commercial neighbor's attempt to completely close down our client's business. We succeeded in preventing the City of Portland from condemning and demolishing the Broadway Hotel for several years, allowing the client to seek financing to refurbish it. We successfully defended a roofing materials manufacturer against claims of breach of warranty, negligence and product liability asserted by a hotel chain owner. We used mediation to resolve claims by multiple parties exceeding $3 million. We successfully defended an owner/developer's allegations against an electrical subcontractor on a multimillion dollar project and recovered all sums owed our client. After obtaining a favorable arbitration decision, we enforced our client's construction lien in court for a full recovery of its claim. We defended a national distributor of commercial and residential plumbing materials in an action by the general contractor for product liability, breach of warranty and "bet the company" loss of profits and business opportunities. Our client settled for less than 1% of the general contractor's claim as a result of meticulous review of discovery documents leading to a concession that the general contractor suffered no lost profits or business opportunities.